This month is Kitchen & Bath month. This week I want to focus on getting your kitchen organized. 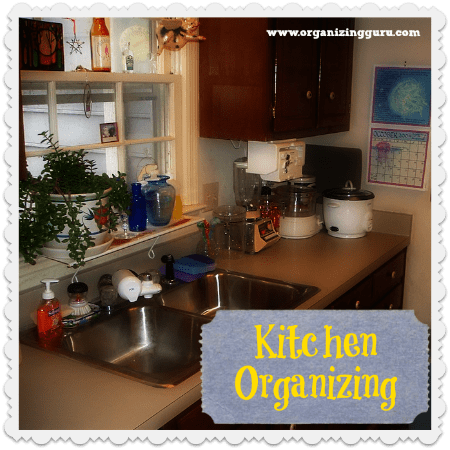 Everyday this week we will focus on organizing some part of your kitchen. So let’s get started! Today you will spend your time cleaning out your kitchen drawers. Get rid of any old and broken utensils. Designate which drawers will hold what. For example you would have your utensil drawer, your baking drawer, etc. Then you want to dive into those junk drawers. And I know you have more than one. Throw away pure junk in the drawer. Use small containers to group like items together. A great example is the drawer below from Pinterest. Today focus on clearing out your spices and clearing out your pantry. Throw away any old spices and make note of the ones you need to buy. Also go through your pantry and throw away any old and out dated food. For a more in depth step by step for pantry organizing see my post here. Today you want to organize all of your recipes. Whether they are books or cards this is the time to go through and purge and see what you still use and what can be thrown away or given away. You also want to designate an area where you want to keep your recipe books and cards. You can keep them on a shelf or in your pantry. Also think about transferring recipes to online programs. This will help you to save space. Today you want to clean off your countertops. You want to only have small kitchen appliances out that you use on a daily basis. The others can be stored in a cabinet or your pantry if you have room. You want to have your coffee maker near where you keep your coffee mugs. If you have a microwave see if you can mount it under your cabinets or over the stove. If this is not an option consider a smaller microwave that will take up little space on your countertop. Today you want to focus on under your sink. You want to take everything out from up under the sink. Next you want to just put back cleaning supplies that you use for the kitchen. You can also put a small trash can up under your sink or recycling sack. These are the only things you want up under your sink. Today’s focus is your cabinets. You want to clear out all of your cabinets. Get rid of old and/or broken items. Any old pots or pans that have lost their coatings you need to throw away. If you have pots, pans, or dishes that are still usable but you no longer use them you want to donate them. You also want to tackle your Tupperware cabinet. Any that do not have tops to them you want to get rid of. After you have cleared out your cabinets and have purged and gone through everything you want to designate a purpose for each cabinet. Once you have a purpose for each cabinet you can start putting things back. For more information about what things you can use to organize inside of your cabinet you can see my article here. Sunday is a day of rest and you deserve it after tackling your kitchen all week. The only thing now to remember is you will need to spend time everyday putting things back where they belong and cleaning weekly. Because you have already gone through everything and purged and organized it should not take you any time to do maintenance. You also want to make a date every six months to go through your cabinets and spices again just to re-evaluate and get rid of things. Last week for Kitchen & Bath Month we talked about organizing your kitchen. This week we will focus on the bathroom. For many the bathroom is their biggest bug-a-boo in their home. Especially if you share it with more than one person. Most bathrooms do not have adequate storage and are cramped at best. Even big bathrooms can have poor design and storage. So what I want to talk about is how to organize your bathroom no matter what size space it is or how much storage you have. Your going to need some basic tools for this. Below are some great bins to use in your bathroom to keep like items together. (clicking on image will take you to Amazon.com. I am a affiliate). I like to use ziploc bags to keep lose items together. Like q-tips or dental supplies. Just about anything you can put in a ziploc bag. And once it is in the ziploc bag you can place it in a shoebox container or other storage container. Shoebox storage containers are great for keeping like items together. You can keep rollers or makeup or just about anything that is small and needs corralling. I like to use all types of storage bins. They are great for grouping like items together. If at all possible try to find ones that stack. If they can stack on top of each other you can use the vertical space that is often wasted in bathrooms. We love these bins because they are perfect to use anywhere. Especially the bathroom. They also come in various sizes. 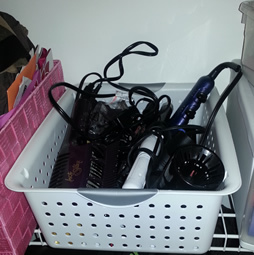 I use one size to hold all of my hair products and another to hold my curling irons and blow dryer. These are great for sliding in closets or even on your counters. You can even fold up and put wash cloths in them. Stacking drawers are great for items such as nail polish, medicines, and even makeup. Once you have your storage containers it is only a matter of going through everything in your bathroom and purging old items and grouping like items together. 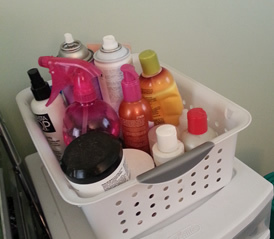 Place what you keep in your preferred bins and then place in the container, on the shelf or up under your sink. Use a hanging rack or corner rack in your shower or bathtub area to keep your bathing products out of the way. There are also slings to keep kids toys organized in your bath area also. Another way to maximize space is to use the area over your toilet. If you can have a handyman to put in a cabinet above the toilet you can use the space to store toilet paper and other bathroom essentials. For the price of a cabinet at Home Depot or Lowes and the handyman’s time you can be maximizing your vertical space. 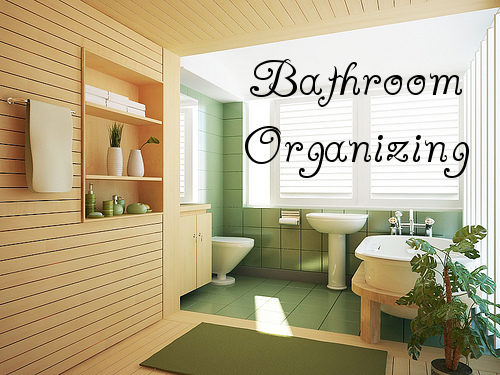 If you would like more tips on organizing your bathroom space check out my article on Organizing Your Bathroom with Simple Tools.